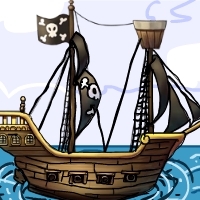 GenieFunGames - GFG Can You Escape this Pirate Ship is another point and click escape game developed by Genie Fun Games. Imagine that you have been trapped in pirate ship. We have to escape the ship before the pirate has came back. He is very dangerous so try to escape from the pirate ship quickly. It's not easy but you can Find useful objects, stuffs and puzzles. Think and solve everything in the game and then escape. Good luck and have fun! bugged in 5 photo at side of door changes when you zoom out and cant do anything with it when back in again . I had no problems with either the size or the puzzles - no glitches - played in FF. NO BUGS in this game - loved it too! No bugs for me either, enjoyed this one very much. I am very grateful for sharing such information.